Ok so it wasn’t so casual. We prefer trails to crowded streets, and rice cakes and cheese to fancy restaurants. 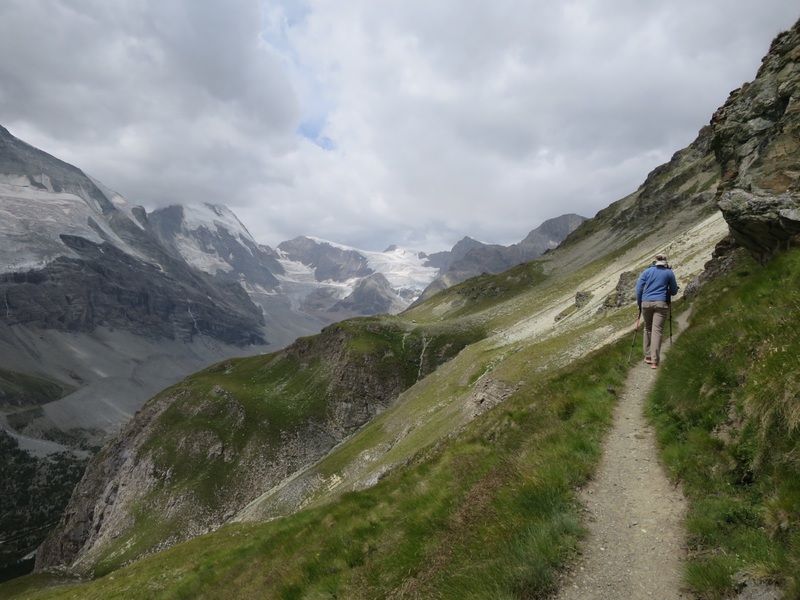 So rather than spending the day ‘relaxing’ in Zermatt, we took to our happy place – the trail. Our bodies were tired the night before. As we have done most of this trip, we slept soundly. Following a nice breakfast of yogurt and fruit we wandered through the streets of Zermatt as the 8:30 church bells rang. 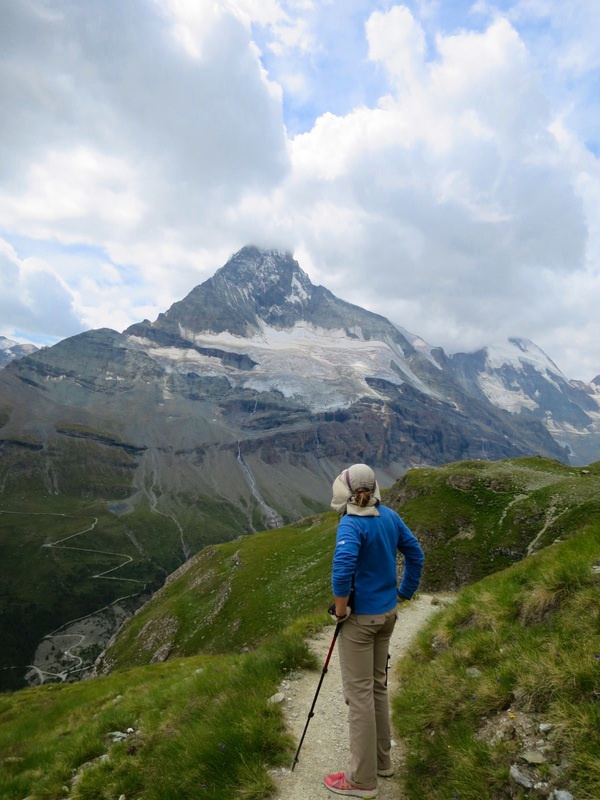 We chose a hike that would provide nice views of the Matterhorn without the crowds. 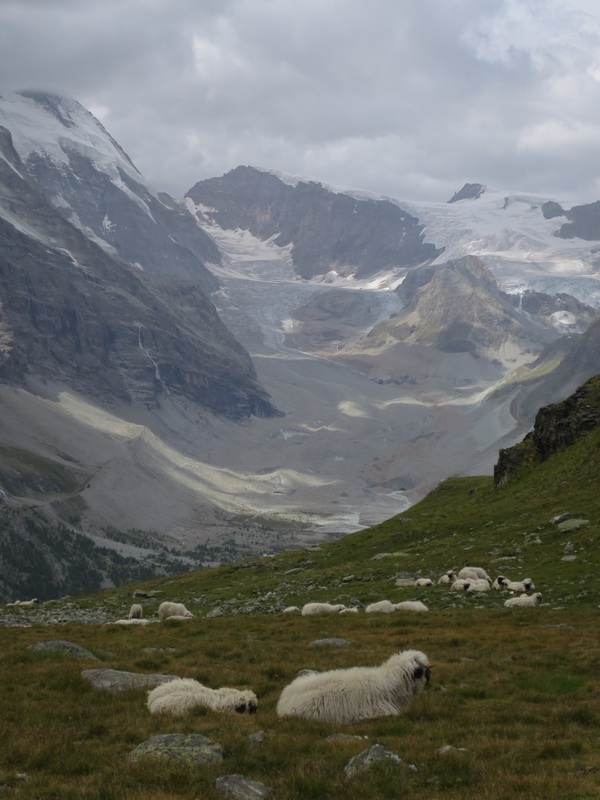 After meandering through Zermatt we hiked out of the valley up toward Trift. The trail switchbacked in the trees following a stream up towards its headwaters at a glacier. One hour into our hike we came upon a hut with smells of carrot cake wafting out the kitchen windows. Each hut offers food and drink and it is hard to walk past them, but we had miles we wanted to cover. From here it was another hours walk to Trift, a single hotel at the head of a valley. Switzerland is amazing in this way. 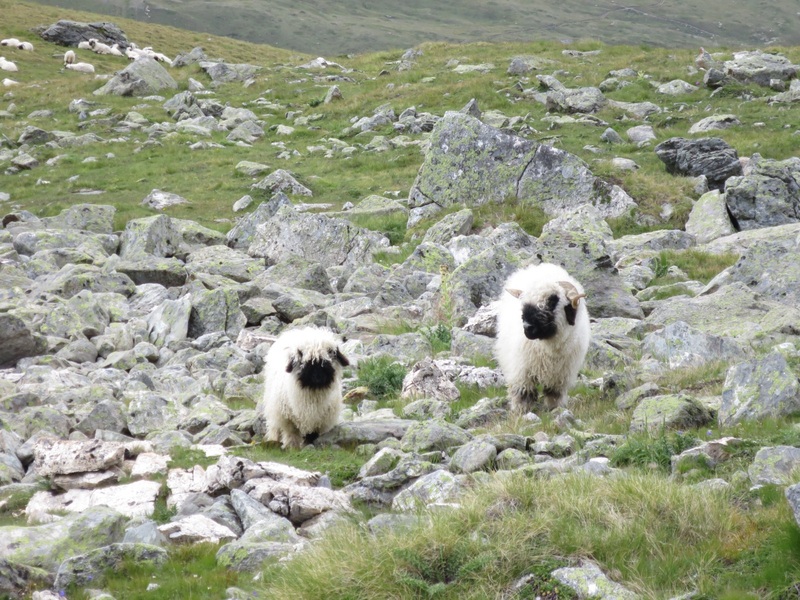 You can hike and hike uphill to your heart’s content and find yourself at a remote hut in a meadow or perched on a cliff serving kuchen (cake), soup and more. From Trift we had a ~500 foot climb up to the high point on the trail. Andy decided to push it and took off while Laurie kept her slow and steady pace. Once at the top we once again traversed the green hillsides. The wind picked up as we searched for a protected spot to have lunch. It was only 11 am but after our big all-you-can-eat hut breakfasts, yogurt and fruit didn’t hold us for very long. 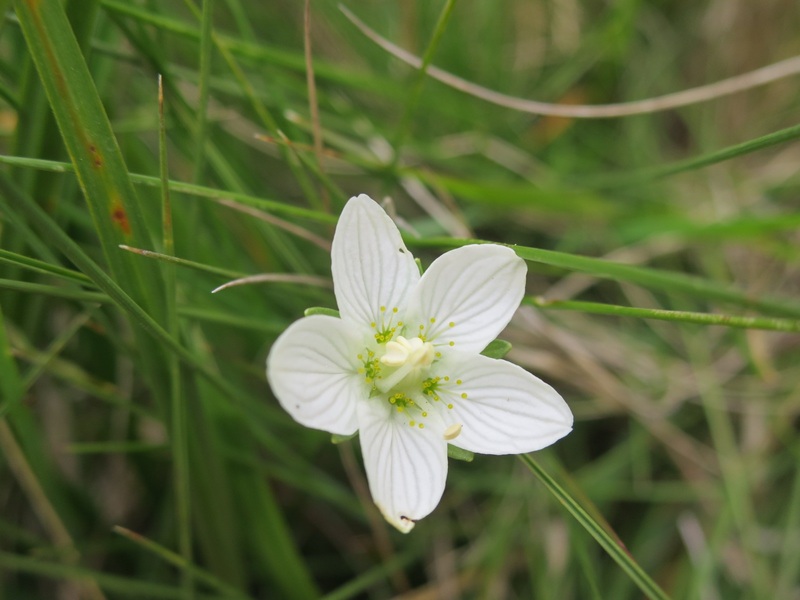 After a lunch consisting of hard boiled eggs, cheese with rice cakes, and bratwurst, we continued on, staying high, past more flowers and a flock of sheep. Eventually we descended into a valley with a hydro-electric plant. It was amazing to see the amount glacier run off and wondered if this plant provided all of Zermatt’s electicity. Our trail was rerouted around a rock slide so we joined the road and fellow hikers descending from the gondola stop to the town of Schwarzsee. Neither of us particularly enjoy road walks. They allow us to cover more miles but are harsh on our feet, not to mention boring. We both wished we had turned around when at the high point to make this a more scenic tour (and eat carrot cake!). Oh well. We descended back into Zermatt around 4 pm. Patrick had allowed us to leave food and a pack at his place, so we headed there to grab our things. From there we walked to our hotel, where we showered after checking in and ate leftovers. Later in the evening we walked through town looking for chocolate to take home for family. We ate dinner on our patio looking out at the still partially occluded Matterhorn. 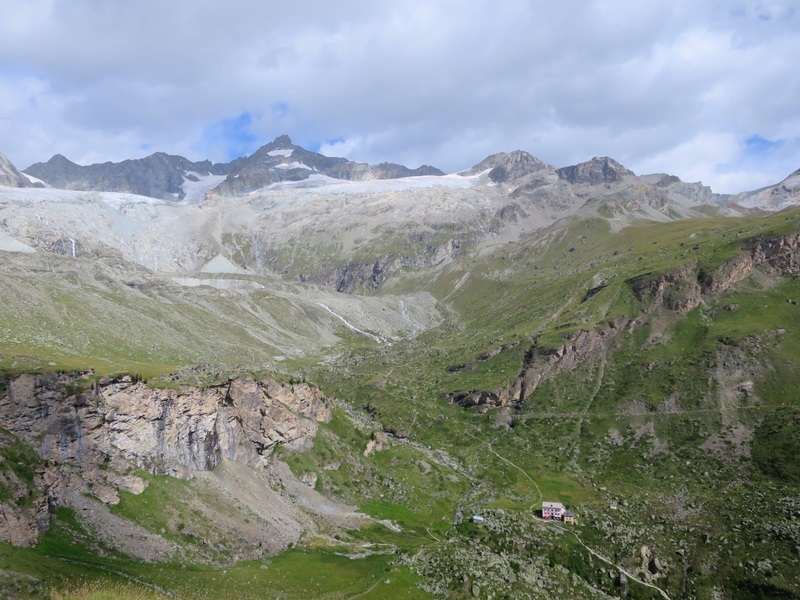 “Good thing we got to see it from Cabane Bella Tola because we might not see it in all its glory during our time here” said Andy. We attempted to go out for a walk after dinner but Laurie quickly faded and fell asleep at 9pm. Andy watched some tv, stayed up way too late and slept around 11pm. Tomorrow we leave Zermatt and Switzerland to start our journey home. We have loved our time in Switzerland, the cows, the alpine tundra and the mountains. 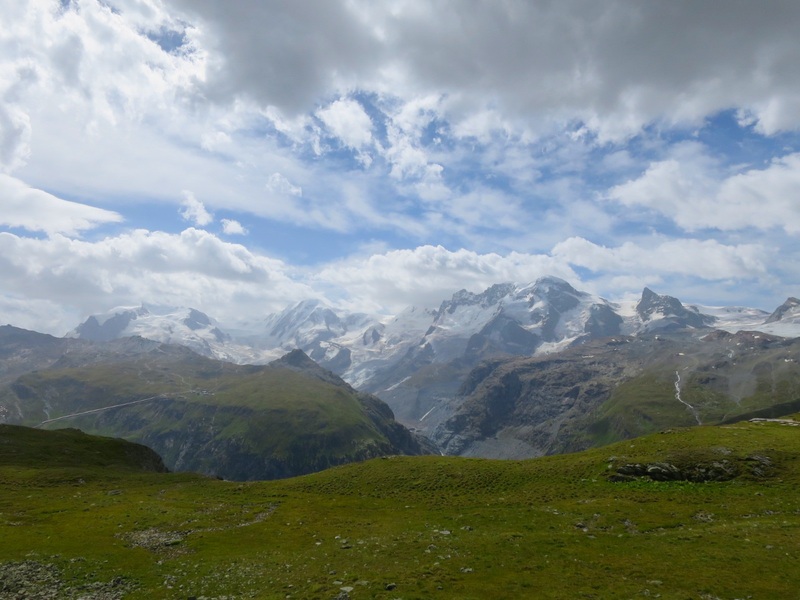 We will certainly be back again to hike more of this country’s majestic mountains, perhaps a 500 kilometer loop that includes the Tour de Mont Blanc, Haute Route and the Tour de Monte Rosa. But that’s for the future. Goodbye Switzerland. Thank you for the memories! Tonight we are grateful for delicious Swiss cheese and chocolate.